Working to achieve a thriving national commercial Wind power industry. Renewable power industry that is recognised as a major contributor to sustained social, environmental & economic security. Advocating for clear and sustainable South African energy policy that realises wind power potential. Promoting the harnessing of plentiful wind energy in South Africa. Promoting excellence in wind power generation and related areas of business. 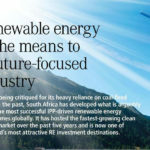 The South African Wind Energy Association (SAWEA) represents the interests of its members who are invested in the South African wind power value chain.